The HNC Fabrication, Welding & Inspection provides you with an essential knowledge and skills platform for tackling many tasks and developing an in-depth knowledge of the industry. 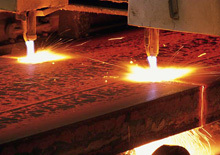 The core of the HNC is the principles that underlie the fabrication and welding industry. You will understand industrial practice in your local industry, the use of materials, and the effects of processes on their mechanical, physical and chemical properties. You will also study inspection methods to allow you to make informed decisions on the quality and serviceability of manufactured products. You will also develop your analysis, synthesis, critical thinking, planning, organising, reviewing and evaluation skills. If successful, you may decide to follow a career in industry, and the HNC should enable you to progress to a more senior level within a company as a Fabricator/Welder, sheet metal worker, or Quality Control Inspector. If you are going to apply to a Professional Body, such as the Welding Institute, for membership, you should check the options required for membership — you may need to incorporate Mathematics for Engineering 1 and/or Engineering Project. Centre staff will be able to put you in touch with the Institute or you can contact them at www.twi.co.uk. Many HNC holders go on to study for an HND. If you have a different background (eg you have suitable work experience, or are an overseas student), you may be accepted if you can show that you could benefit from taking the course or individual Units. If you are convinced that you already have the required competences in a given area, the centre may have alternative access arrangements, such as: assessment on demand, credit transfer, and accreditation of prior learning.